A turning point in Israel-Turkey relations? Erdogan hinted that he may be seeking a reconciliation with Israel. By: AP and World Israel News Staff. 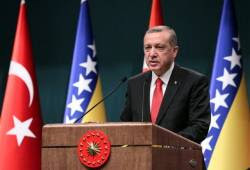 Turkish President Recep Tayyip Erdogan has signaled a possible warming of relations with Israel, saying the entire region would have much to gain from normalized ties. Relations between former allies Turkey and Israel broke down in 2010 after the Mavi Marmara incident. The Mavi Marmara was part of a flotilla of vessels traveling to the Gaza Strip, ostensibly to deliver humanitarian aid and medical supplies, but in reality it was an attempt to defy Israel’s sovereignty and to support the Palestinian Hamas terror organization, which rules Gaza. The only humanitarian aid found on board were boxes of expired medications. Turkey has become the strongest critic of Israeli actions in Gaza, often marked by anti-Semitism. Reconciliation efforts between the two countries have repeatedly failed. Even an Israeli attempt to apologize to Turkey was rebuffed. Erdogan told journalists during a flight back from Turkmenistan that “normalization with Israel” was possible if the sides can reach a compensation deal for the raid’s victims and if Israel lifts a blockade against Palestinians. His words were reported by the Yeni Safaknewspaper on Monday.